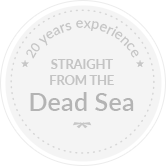 The benefits of Dead Sea salt have been known for centuries. The secret of Dead Sea is the mineral content of the Dead Sea salt! Egyptians used mud from the Dead Sea in their mummification of the deceased. The Dead Sea considered by the Christian tradition to be the spot where John baptized Jesus.